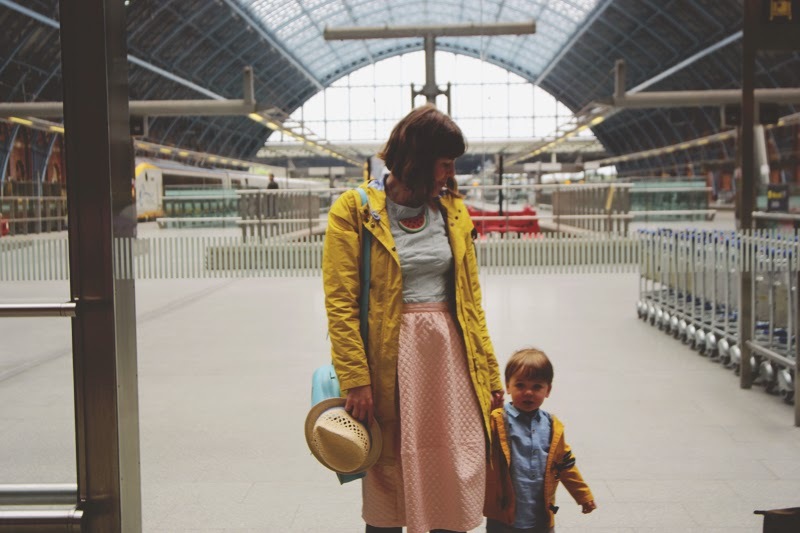 We travelled by Eurostar on our trip to Paris. Can you believe I've never been on the Eurostar before? As they are just celebrating their twentieth anniversary I'm not sure how I'm just getting round to it but so glad I finally have! 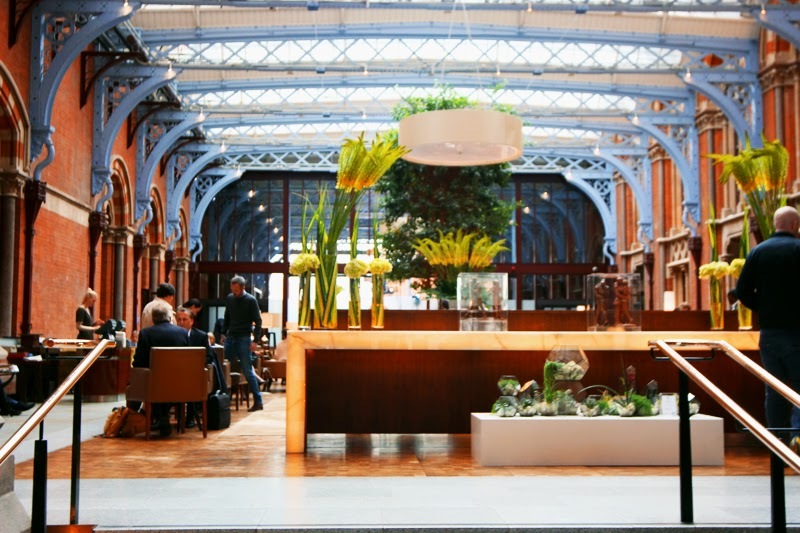 We also got to sample a super swish concierge service with the St Pancras Renaissance Hotel which was such a treat. 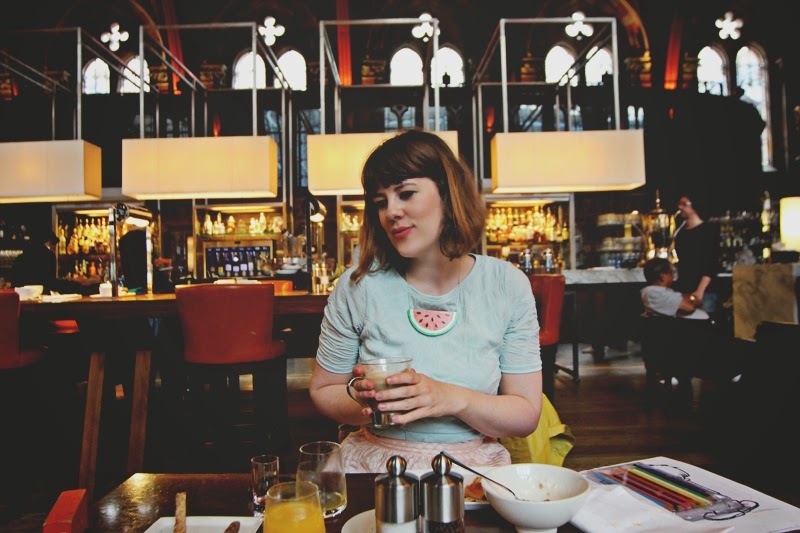 After our little early morning walk in Regents Park we popped into the St Pancras Renaissance Hotel for brunch. 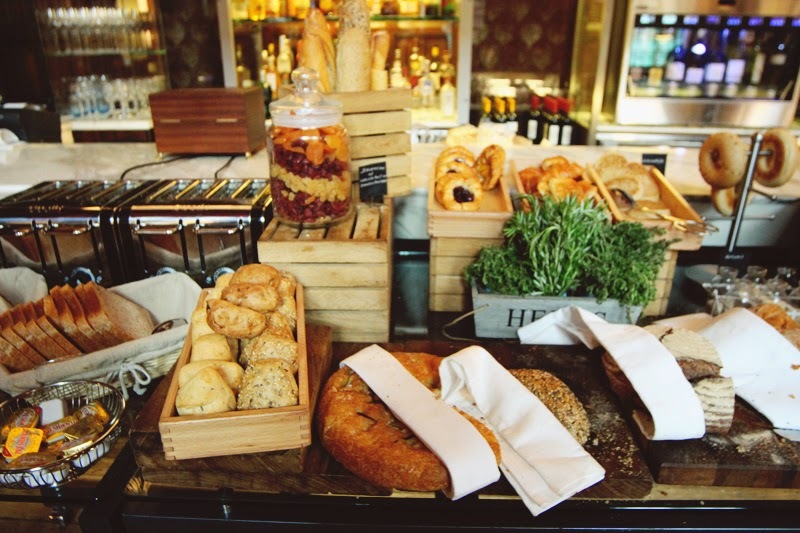 We were seated in the grandest of restaurants and told to help ourselves to the buffet breakfast station. Amongst rows and rows of pastries and breads, cheeses and fresh fruit we helped ourselves bits of everything with gumption. Wilf had great fun buttering his own toast whilst we downed our beetroot smoothie shots washed down with coffee a plenty. The staff at the hotel were great and really child friendly with children's colouring sheets and crayons to keep little ones entertained. After letting our tummies settle (we couldn't even fit in any of the delicious items off the menu, I'm still kind of regretting that choice) we headed to the concierge desk where our bags where being looked after and we headed down to the station. Whisked through business class within ten minutes we were settled on our seats and ready for our adventure! That's including the amount of time it took to frisk me when I set of the alarm in the detector ;) I'd certainly recommend this service for a completely stress free start to a holiday! The journey by Eurostar was fantastic, within a couple of hours we were in Paris and straight out the door to the city streets. We travelled in the standard class section which was really spacious in-fact as Wilf is only two we didn't need to buy him a seat and he had lots of room to sit between us on the journey. You can see the difference in services here. There is an onboard cafe which stocks products from Waitrose (the middle class Ocado shopper in me felt very at home there) and is spacious enough to chill out in for a bit if you needed to stretch your legs. What I thought was really useful was that you are able to buy Metro tickets on the way to Paris and also Oyster cards on the way back to London. We bought a book of ten Metro tickets which saved us having to queue for them at the other end. We had a paper ticket but by downloading the Eurostar app you can also use it as a digital ticket, one less thing to worry about and I do love me a good app! On our return we used the standard checking in system, we arrived an hour to our departure time and were through check in within around twenty minutes. With a little over half an hour to spare we bought a final croissant each with our left over euros (a great distraction with Wilf) and when it was time to board it was a really relaxed walk to the platform. A completely different experience to flying and one I certainly prefer, I'm already planning all our future travels on the Eurostar. 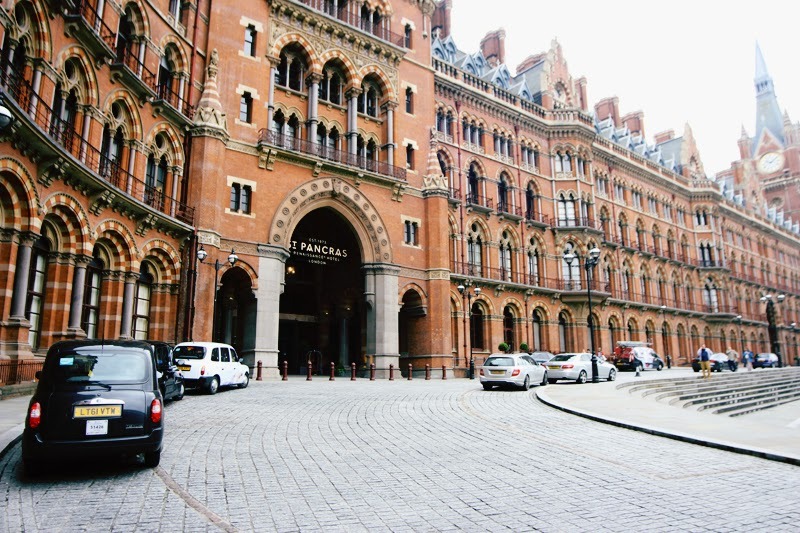 We were guests at the St Pancras Renaissance Hotel and received free standard class tickets for our trip to Paris but all words and thoughts are my own. 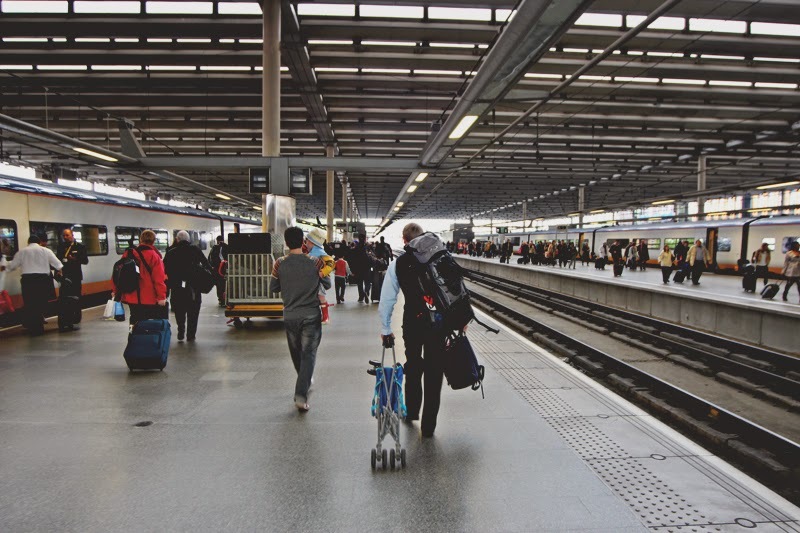 I love the photos of St Pancras! 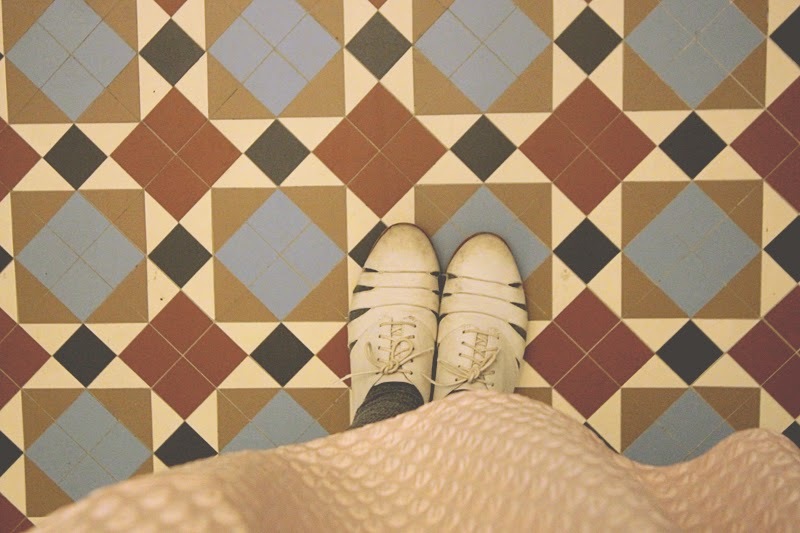 I used to travel by Eurostar all the time to see my family, so this post has actually made me a little nostalgic. 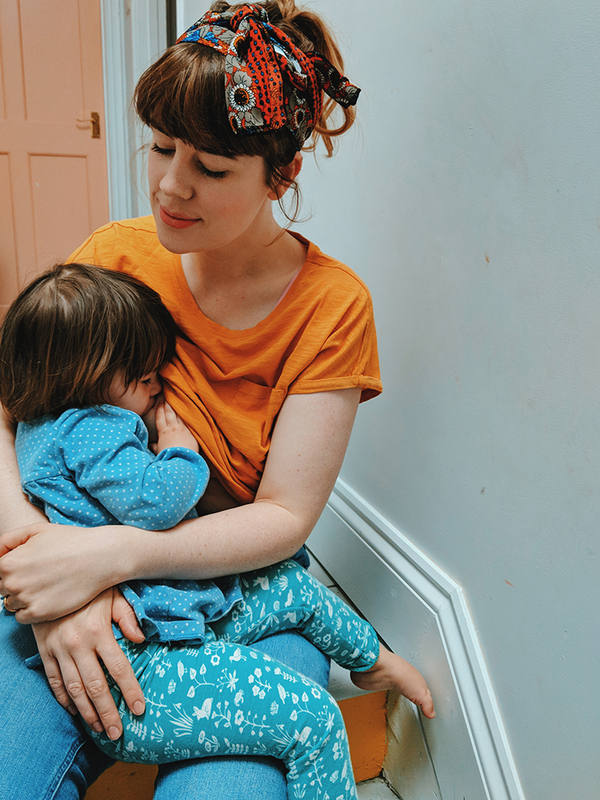 As we've moved further away we now have to get on a plane to see them, which just involves so much more stress and faff. I used to love shopping at St Pancras especially, it's a far better terminal than the ones in Brussels or Paris. I love the train, such a nice experience- hate hate hate flying but Im afraid I have to do it, when I used to go and visit Al in Switzerland the easy jet flight was 34 quid and I really really wanted to go on the train !!! I've only been on it once! It was soooo overcrowded but that's because it was headed for Eurodisney. That hotel is one of the most beautiful in the country. 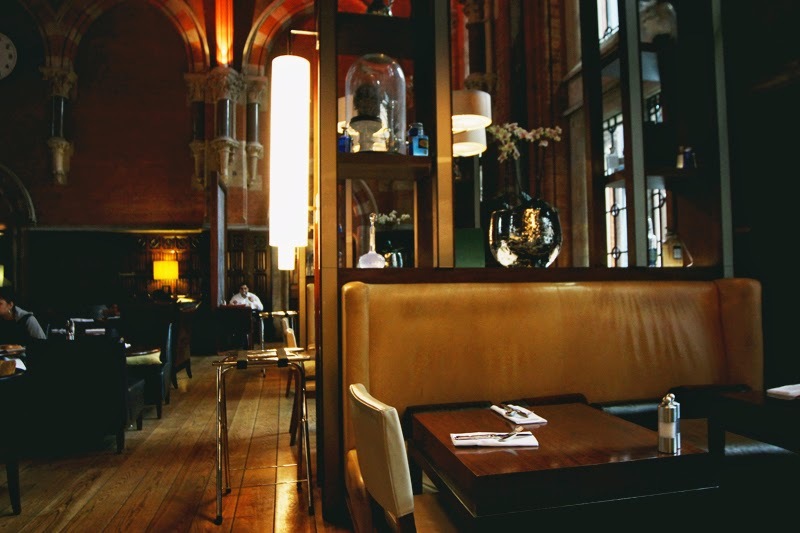 The Gilbert Scott is the most romantic restaurant ever. And I can recommend the spa too. I've been spoiled there a bit. Plus, obviously the Spice Girls filmed Wannabe there when it was derelict so you can go and zig a zig ah on the stairs. That looks great. I love the Eurostar. The hotel looks wonderful and i adore your photos. 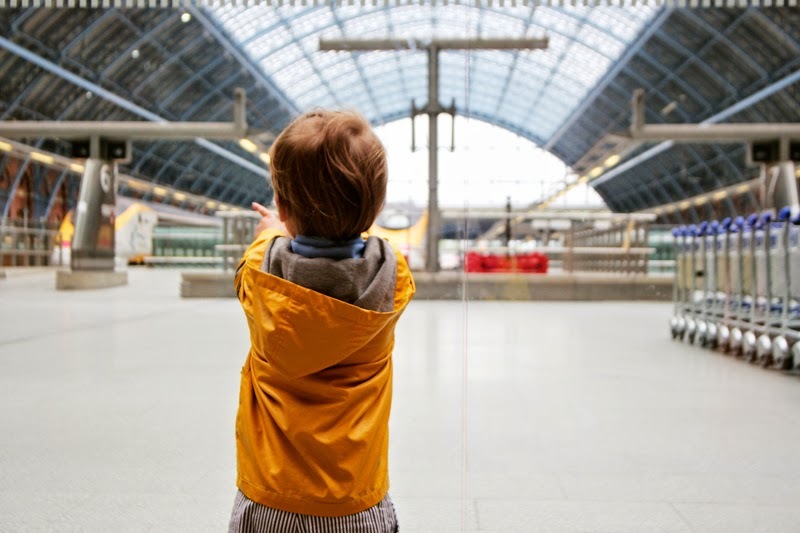 Never been on the Eurostar and wondered what it was like. Looks great. Ah-haaar me hearties! Looking beautiful as usual in that unselfconscious not-even-trying kind of way you have Fritha. If there's anyone who can persuade me into a dress it's you. Looks like a great day, Clearly Wilf is a ship's captain in the making, albeit one who gets someone else to do the steering. I haven't ever been on the Eurostar. Must change that! I have also never been on Eurostar, but I think you just sold me with the mention of the on board Waitrose products! It sounds like a wonderful outing on Eurostar. Lovely clicks too. Oh I have holiday envy all over again. What a perfect start to your break. 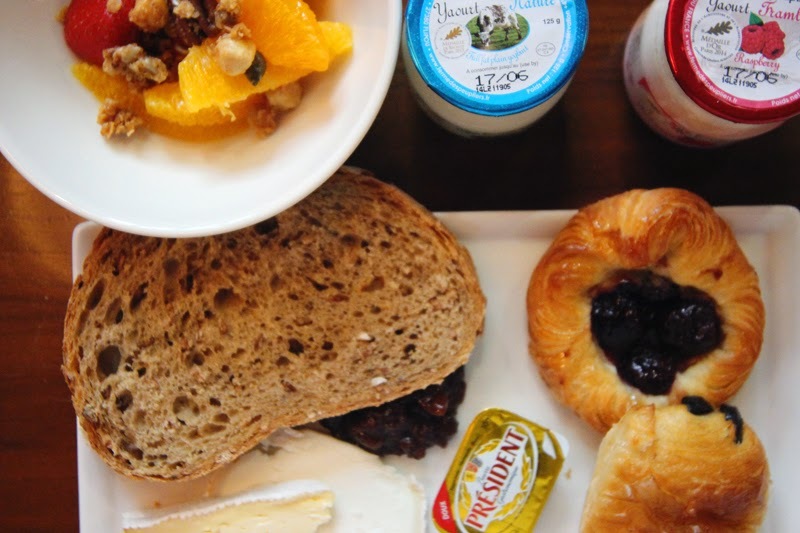 Love a posh hotel breakfast, me. 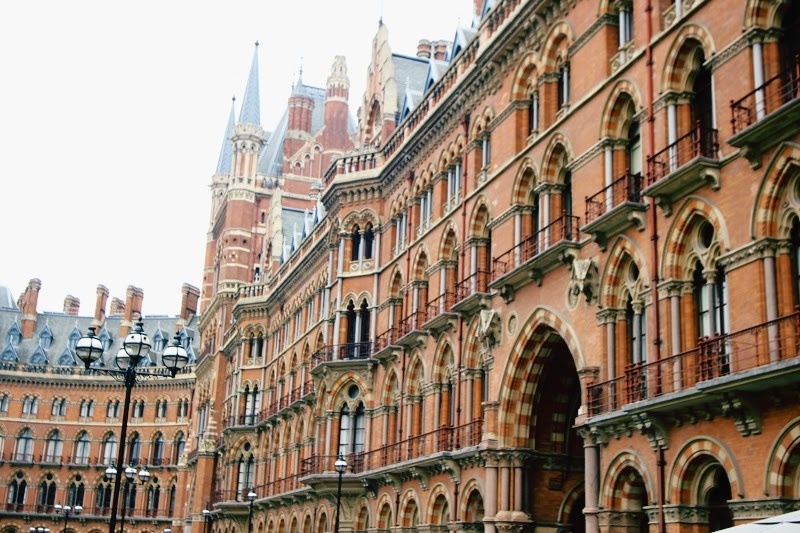 Wow St.Pancras station looks amazing, we've never been there! I think Theo would love to go and see the station just on its own! 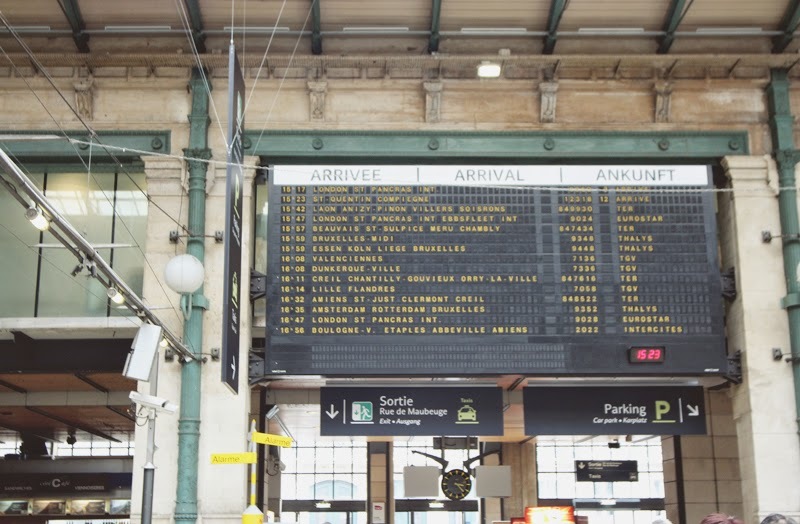 We've considered travelling to France a few times on the Euro star before, and considering it's so quick and Theo loves trains I think it would be great! I am in st pancras quite often but have never thought about using the Eurostar before. I really must get on the Eurostar sooner rather than later. LOVE those sandals! And I can't believe I haven't made it over to the SS Great Britain yet, I must do that soon! I love Eurostar, it feels like such a treat and adventure, especially now that St Pancras station is so swanky with lovely shops. They weren't doing onboard Waitrose products last time I went though, fabulous!